Below is an excellent documentary about prescribed fire in the Everglades NPS in Florida. They document the whys, hows, and whens. At 13 minutes long, it’s a good change of pace from reading the Sunday morning news. Fire is a very important disturbance (read: renewal) agent in many ecosystems around the world. Even in North America, fire is the driving force behind almost every ecosystem; from its genesis, to keeping it renewed, healthy, and strong. 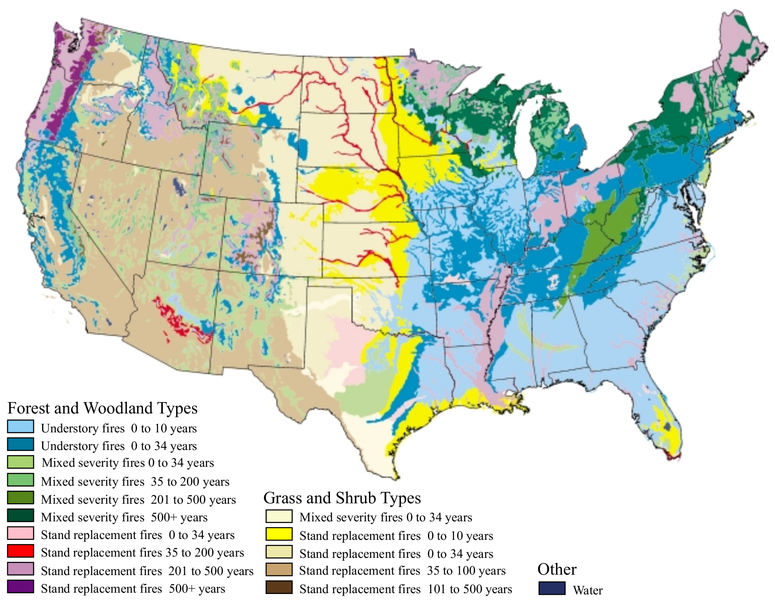 A look at the image below shows the fire regime types based on Kulcher’s Natural Vegetation types for N. America. Source: Brown, James K.; Smith, Jane Kapler (2000). “Wildland fire in ecosystems: effects of fire on flora”. Gen. Tech. Rep. RMRS-GTR-42-vol. 2 40,56-68. Department of Agriculture, Forest Service, Rocky Mountain Research Station. Retrieved on 2008-07-20. Author: Jim Menakis. 2000. Even the Lone Start State has its big share of fires. Click for larger image. Fire is especially a rejuvenating force in the prairies. Fire suppression, although needed to a good extent, generally tends to cause more damage in a lot of areas than it “fixes”. It is a short-term fix, a band-aid for looming and larger problems. In the East, fire suppression can cause a decline in Oak (Quercus spp. ), Pine (Pinus spp.) and other fire tolerant species (the very species whose wood products consumers ask for at the lumberyard), shifts forest communities from fire tolerant to fire intolerant communities of Maple (Acer spp. ), Basswood (Tilia spp. ), Elms (Ulmus spp.) and others. If let go long enough, this type of species shift is inevitably damaging, as noted in this excellent article, making the reintroduction of fire much more costly. I believe a lot of our fire problems starts with a lack of education: in the 1950s on, Smokey Bear gave every American the wrong message in the long run, schools no longer teach basic ecology (including fire ecology) classes at any primary educational level, as well as the general trend in the urbanization of the mindsets of millions of Americans; they have lost touch with nature and its basic fundamental principles. Healthy ecosystems are what keep us all alive. And fire is what keeps those ecosystems healthy. Tagged Everglades NPS, fire, fire dependent ecosystems, fire suppression, prescribed burning, Smokey Bear.